I remember my first experience with an electronic viewfinder (EVF) very well - it was rather unpleasant. I did not know EVFs even existed at that time and was hence surprised by the yellowish faces and lagging display of the scene as I moved the camera around. I never spent much thought about the topic again and put EVF in my "useless" drawer. To my surprise, I ended up buying a camera with an EVF last year and I am enthusiastically using it ever since! Technology has of course advanced very much and the most recent generation (even the one before) is much superior to the version that bungled my first EVF experience. For me, the main advantage of using an EVF is the fact that it shows an image that is much closer to the actual photograph than an optical viewfinder can. The EVF shows an image that resembles the scene under the actual exposure settings. This is an enormous advantage when I manually adjust exposure or when using neutral density filters to prolong exposure times. Normally, this would render the viewfinder so dark that you can not recognize anything at all. The EVF will show a clear picture of what you are shooting. During our recent holiday I have been experimenting with neutral density filters and really learnt to appreciate the workflow. The only tiny problem is the autofocus, which refused to work under the artificial low-light setup. However, this is easily resolved by focusing before adding or darkening (a variable) neutral density filter or by manual focus. If you use autofocus, do not forget to switch to manual focus mode before darkening the scene with the filter because otherwise the autofocus will get crazy. 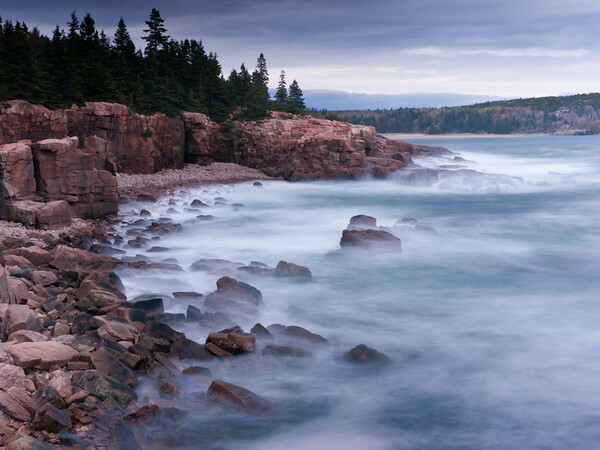 This is an example photograph of the coast of Maine in Acadia National Park during bright daylight; photographed with an exposure time of 15 seconds thanks to neutral density filters. There are of course other advantages of EVFs: the overlaying of camera settings and histograms, 100% view of the frame or automatic adjustment of the frame format. For me, these are all just icing on the delicious cake of being able to view my composition under the actual exposure settings. I do not miss my old viewfinder at all!